In summer season due to lot of sweat, our body give up high amount of water. If any one has tried the taste, you find the sweat a bit salty. This indicates that the body along with losing water gives up other nutrients in the form of salt. Such a loss of nutrients brings the body glucose levels down and it loses lots of energy. 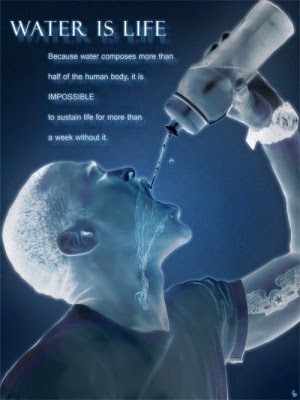 We must be extra careful during summers and must consume higher amount of water than in normal winter days. But how to achieve so. 1) Drink if you get up after half sleep: It is well said that body needs 8 hours of sleep. During summers, 8 hours are too much without water. Keep a water bottle near to bed and you must have water if you get up during the nights. 2) Drink a glass of water before you sleep: This is the most efficient way to make you get up during the night. If you drink a glass of water before sleep, 90% of chances are there, you will get up during the night to pee. This will allow you to have some water before you sleep again. 3) Drink just after you brush your teeth: This is the most important part of the day and if water consumed at this moment will surely help you in keeping the body hydrated. This is because, during the morning time when we leave for office or school, just after the shower the body temperature fluctuates too much resulting in high amount of sweat generation. If after having brush, the body could have 1 glass of water, that will be used by the body to generate sweat. 4) Drink while you travel: Along with the lunch box, your bag should have a bottle of water. This practice is followed by many individuals but due to rush in trains or while travelling, we won't be able to have water in chunks. And when we get time, we just have water in bulk. We should avoid this. Before jumping into trains or buses, we should have some water and must keep on having during the whole journey. 5) Don't drink once you reach office: Allow your body to relax and wait for 15 minutes before having water because the body temperature is at the highest at this moment of time. Allow it to relax and make body temperature reach normal. Now its important to not to have only water but water + glucose or water + electral or any other solution that allow the body to generate energy and salts that got released along with sweat. Follow the process while travelling the home too, but generally during the evening hours, body will generate less amount of sweat than in morning.